First published as a paperback original in the US by Dell in 1974, Mr. Majestyk is Elmore Leonard's adaptation of his own screenplay for the same year's Bronson-headlining, Richard Fleischer-directed Mr. Majestyk movie. I found this copy of the Dell edition in the basement of the fine Cecil Court secondhand bookshop Tindley & Chapman, along with another, earlier Elmore Leonard paperback original, one which I'll be blogging about down the line, and which shares with Mr. Majestyk a similarly monikered – but unrelated – character. 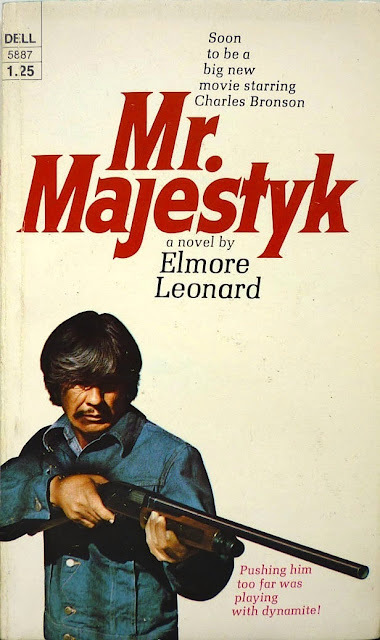 Though it's true that Mr. Majestyk (the novel) is, in effect, a novelization, it's also true that it's one of Elmore Leonard's best books. It's a long time since I've seen the movie, but I don't remember it being anything other than a pretty decent action flick – an estimation borne out by this contemporaneous New York Times review (although that review strikes me as being a little too dismissive). Leonard's novel, on the other hand, is short, taut, lean, and moves like a well-oiled machine. The story centres on Vincent Majestyk, a melon farmer eking out a meagre living in the dusty midwest. Vincent is confronted by a hood named Bobby Kopas, who tries to foist a crew of inexperienced melon-pickers on Majestyk instead of the more skilled migrant workers Vincent usually uses. Rather than capitulate, Majestyk thumps him and sends him and his men on their way, and is promptly arrested. In jail awaiting a bail hearing, Majestyk meets mob hitman Frank Renda, and gets caught up in Renda's escape attempt; after unsuccessfully trying to turn Renda over to the cops, Majestyk finds himself beset by both Kopas and Renda – along with Renda's right-hand man, Eugene Lundy, and assorted hired thugs – leading to a violent climax. 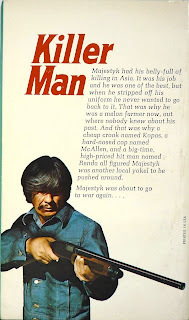 Mr. Majestyk was only Elmore Leonard's third crime novel – prior to 1969's The Big Bounce he'd concentrated exclusively on westerns – but even by this stage his distinctive tone and style was firmly established. I've written before about his seemingly effortless storytelling – see, for example, this review of his most recent novel, Raylan (2012), or, more appositely, this post on Pronto (1993) – and that sublime and unique sense of a tale being told is present and correct in Mr. Majestyk. But Leonard's genius also resides in his handling of characters, and in the way he can elicit sympathy for even the most unsympathetic of players. 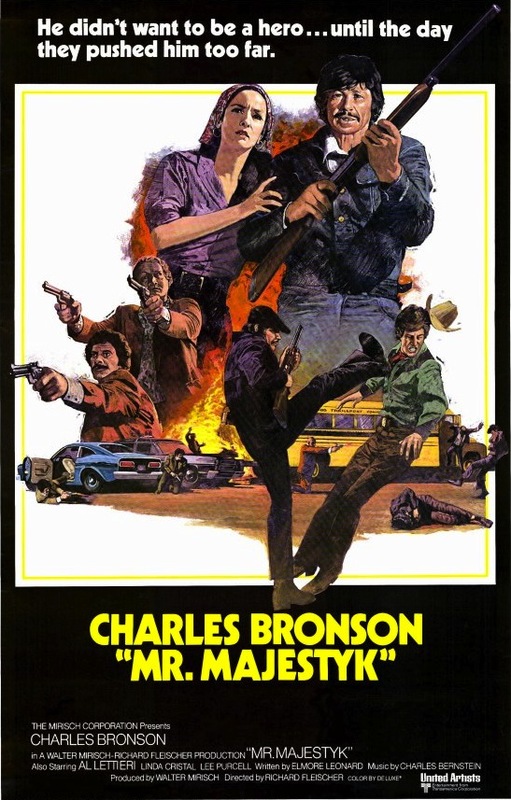 Of course, the "good guys" are compelling too, simply and deftly defined with just the merest hint of background (brief recollections from Majestyk of his time fighting in the jungles of Asia; Vincent's foreman, Larry Mendoza's loving family; Nancy Chavez, with whom Vincent becomes involved, and her hard life as a drifter and union organiser); but Leonard spends just as much time, if not more, on the "bad guys". 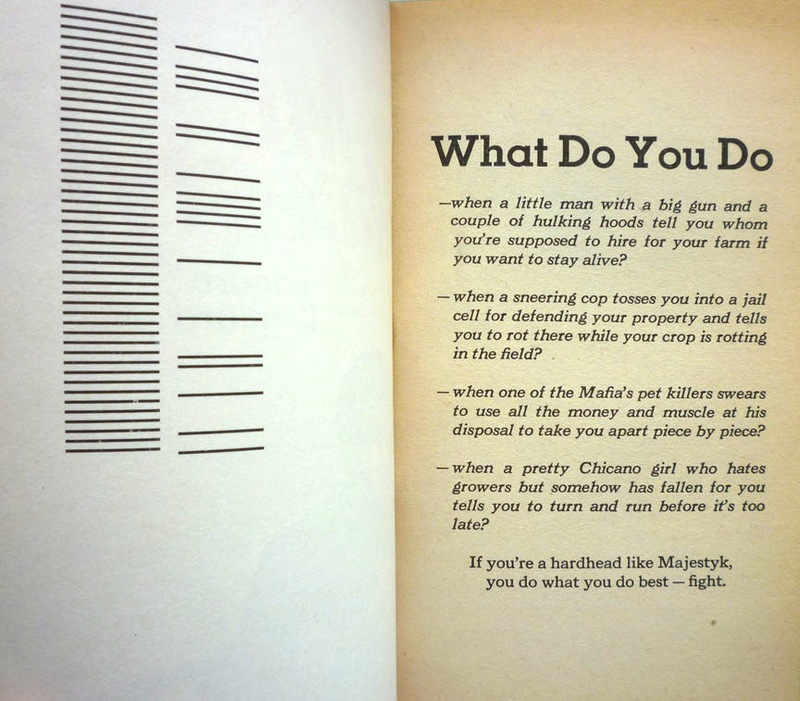 Frank Renda in particular is a fascinating creation – cold, calculating, and yet troubled by doubts over his effectiveness as a killer, driven to pursue Majestyk even though common sense (not to mention his lawyer and mob bosses) dictates that he should leave well alone – but even Kopas and Lundy (who, curiously, share in common with Renda five-letter surnames) are given space to live and breathe, so that when their ultimate fates unfold, it's oddly touching. I've been asked a couple of times recently where the best place to start is with Elmore Leonard; I've duly directed said interested parties to to his 1990 masterpiece, Get Shorty. Actually, though, on reflection, I reckon Mr. Majestyk is just as good a place to dive in: if you don't "get" Leonard after reading this one, you probably never will. Top book and a top film - one of the many stuck in the atticeto be re-read before disposing of. I always remember being slightly disturbed by the watermelons getting shot-up in the back of his truck...probably some sort of Catholic guilt thing going on with such a terrible waste of food with all the starving millions in the world! I rather like the 'do he's rocking in Mr. Majestyk, Col. Bronson's certainly a good fit for the movie – I don't know if Leonard wrote the screenplay/novel with him in mind, but I wouldn't be surprised if he had: he describes Vincent as looking more like a migrant labourer than the farm owner he is, and Bronson's definitely got the right look for that. I saw an interview with Leonard years ago where he pointed out that he'd originally written the character as a cantaloupe farmer but the producers had been unable to get hold of enough cantaloupes for the film, so they just used watermelons. Apparently critics at the time saw the smashed watermelons as a metaphor for human flesh. Oddly enough, judging by the bits and pieces I've seen online, people do seem overly disturbed by the watermelons being shot. Seems to be the moment in the movie that's stuck in everyone's mind, so the critics might have had something there, however unintended it was.